The Emerald Street Community Centre, originally erected in 1963 as an infant welfare centre, was designed by Garnet Price, Shire Engineer and Building Surveyor to the Shire (later City) of Keilor. 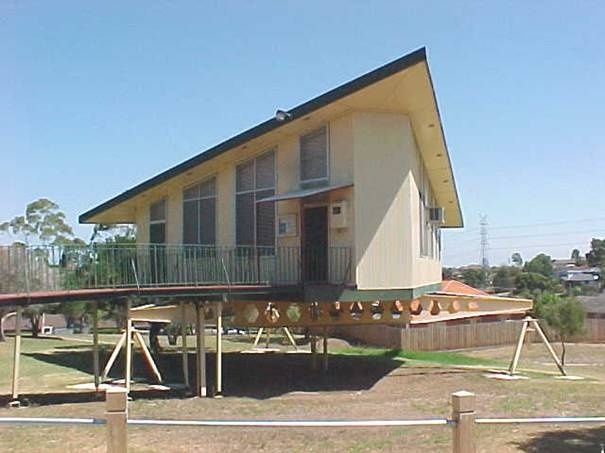 Located in a public reserve, it is a building of notably distinctive form, having a splayed triangular plan and steep skillion roof, mounted on a unique tripod-like steel substructure that was specially designed to provide adequate foundations on unsuitable land. The Emerald Street Community Centre is of aesthetic, architectural and technological (engineering) significance, and historical interest, to the City of Moonee Valley. Architecturally, the Emerald Street Community Centre can be considered as a quintessential, if rather late, example of the so-called "Melbourne School" of contemporary architecture that emerged in the early 1950s, and perhaps the finest example in the municipality. The small building boldly displays two of the defining characteristics of that style: experimentation with pure geometric form, and the use of unconventional structural engineering. The latter, manifested in the use an offset triangular frame of steel beams and adjustable screw threads mounted on tripods, is of technological (engineering) significance. While it has broad parallels with other "Melbourne School" structures of the 1950s, this specific manifestation appears to be unique. Aesthetically, the building is significant for its highly unusual, if not entirely unique, exterior form. With its distinctive triangular plan and elevated foundations, the building stands as an eye-catching structure in the landscaped setting of the public reserve, remaining readily visible from all sides as a sculptural element in its own right. Historically, the building is of local interest as one of a number of purpose-built infant welfare centres that were erected in the 1950s and '60s in those parts of the former City of Keilor, such as Niddrie and Avondale Heights, that were experiencing rapid residential growth (and a consequent increase in their respective birth rates) at that time. The former infant welfare centre is a small single-storey building of particularly distinctive form. The building itself has a triangular plan (albeit with splayed corners) and is raised up on a triangular steel frame, rotated 45 degrees, thus creating a footprint in the form of a six-pointed star. The raised portion has a steep tray-deck skillion roof, aluminium sheet wall cladding, and bays of tall aluminium-framed double-hung sash windows with external grilles. The highly unusual substrate frame comprises three large tapered steel I-beams with pierced flanges, supported at each intersection by a metal pipe tripod with an adjustable screw thread. A timber-decked ramp extends from the footpath level to the main entry, near the north apex of the building. A gangway extends across the north-west elevation, providing access to a second entrance. The exterior of the building is substantially intact. The interior, however, has been somewhat altered by the removal and reconfiguration of original partition walls to create new spaces, and the installation of new kitchenette.